Huh? I'm not Indy... Or am I? 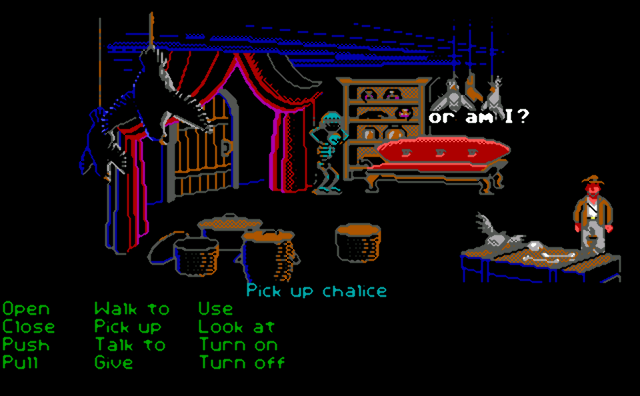 In the Passport to Adventure EGA demo for DOS which includes demos for The Secret of Monkey Island, Loom, and Indiana Jones and the Last Crusade, if you try to pick up the chalice, Guybrush says that he is not Indy before transforming into him. His body then changes back to Guybrush's with Indy's head, and then back to Guybrush. Guybrush then states that he's had an identity crisis. The Indy sprite is from The Last Crusade.